4. Double cylinder strong take-up device, with height limit, strong lift force, reliable and high efficiency. 5. Installed famous brand clutch, optional Germany LUK brand clutch. 6. Optional to install 16F/8R creeper shift or 8F/8R shuttle shift, the shifts matched reasonable, have a good agricultural adaptability. 7. 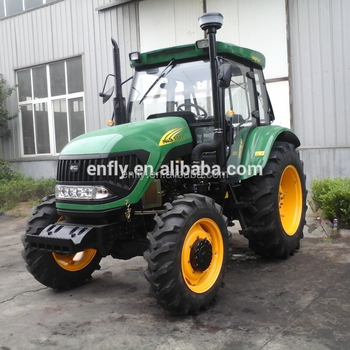 Optional double speed PTO( Power Take Off): 540/1000,760/1000r/min showing high working effiency. 8. Optional PTO shaft of 6 spline or 8 spline, adaptable for agricultural equipment of all over the world. 9. Stremlined appearance design, beautiful and generous. 10. Optional luxury closed drivers cabin, equipped air-conditioner, CD player, radio, adjustable soft seat, luxury inner decorations etc..